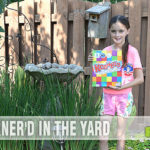 Although we’ve featured a number of puzzle challenges by ThinkFun over the years, up until now none of their products have reminded us of board games in our collection. They have been unique and challenging in their own ways, and have completely stumped us on more than one occasion. 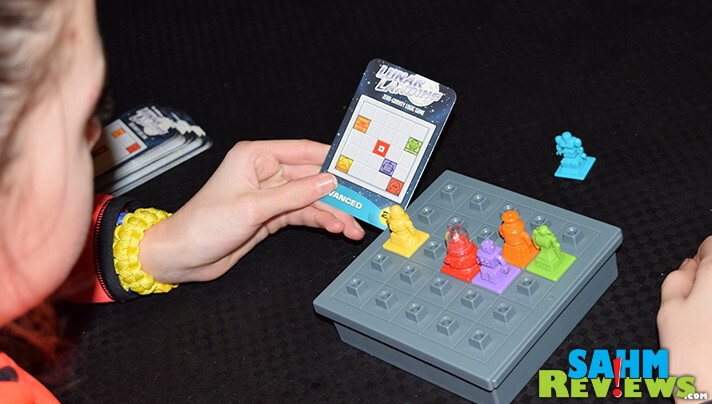 Lunar Landing is another in ThinkFun’s line of puzzle games with forty challenges that get more difficult as you solve them in order. 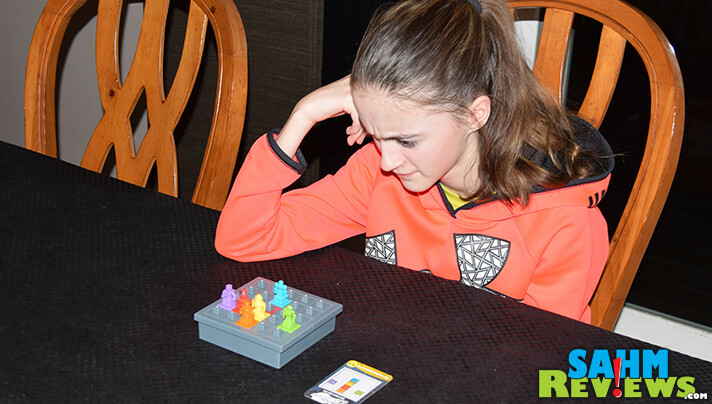 This latest puzzle game is one that instantly brought back memories of a classic board game we have enjoyed for years – Ricochet Robots. 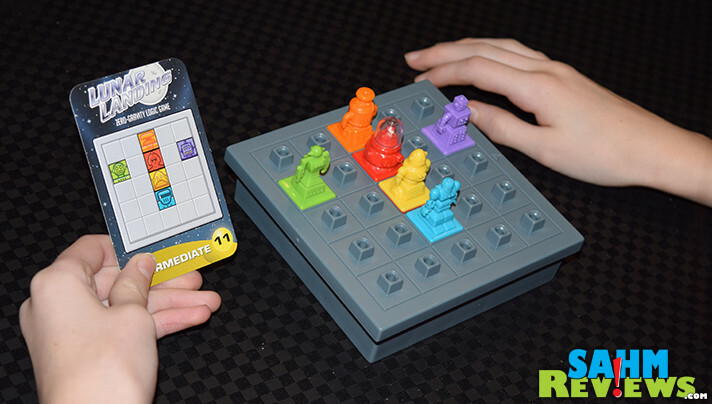 In that game you are trying to get your robot to one of the pre-determined spaces on the board before your opponents can. The idea for each turn is to get the like-colored robot to a randomly selected target. The trick is that once a robot starts moving, it will continue to move until a wall or another robot stops it. Therefore, players are seeking a sequence of moves for the robots that will enable them to move the required robot to the target in the fewest moves. 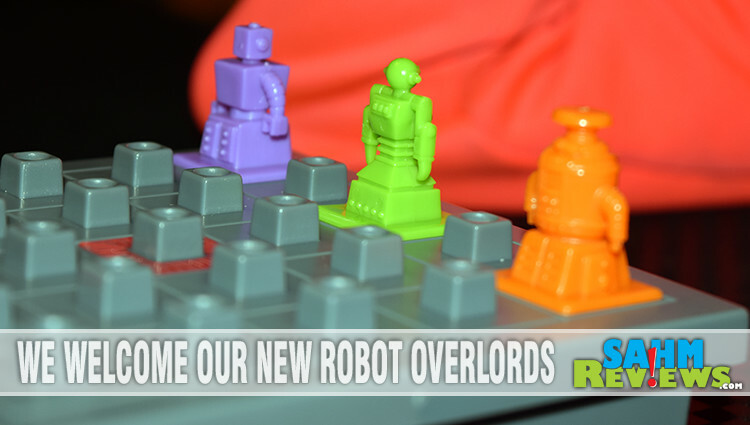 One player calls out a number of moves that they think they can move the robot successfully to its goal and the other players have until the timer runs out to find a way to do the same thing, but in fewer moves. The person who successfully gets the robot to the target in the fewest moves gains a token and the person with the most tokens at the end of the game wins. While Ricochet Robots can be played single-player, it really shines with more than one (and the box claims up to 99 people can play, but we don’t have a kitchen large enough to test that). ThinkFun’s Lunar Landing steps in to fill the gap with preconfigured challenges that have only one solution. And you must figure it out. 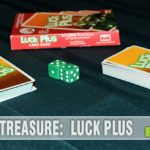 Included in the box are five colored plastic robots, a red shuttle and a plastic game board that nicely holds the entire game’s contents, including the deck of 40 cards and instructions. 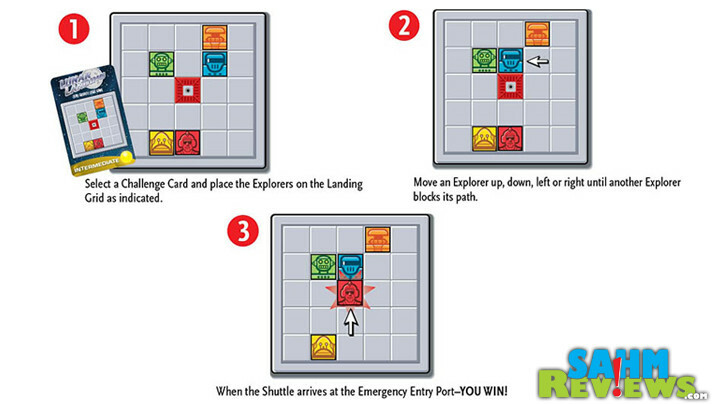 Like other ThinkFun puzzles, Lunar Landing begins with simple challenges designed to teach you the game as you go. The front of the card diagrams how the board should be prepopulated and the solution is conveniently printed on the back (don’t peek!). The goal is to get your shuttle to the center of the board, which represents the Emergency Entry Point of your Mothership. Since you are supposedly floating in space, you can only get to the opening by drifting until you run into a robot, stopping your progress and allowing you to change directions. To be successful you must also get these robots into the correct positions needed by the shuttle. You may move any robot or shuttle in any order with just one limitation. They move in only one direction (horizontally or vertically) and must keep moving until they run into a robot. They may not move to the edge of the board as they will theoretically keep moving and float off into space! And running over the portal doesn’t get you in – you must also stop exactly on the center spot by running into an adjacent robot in order to enter. Challenges range from very easy (literally two moves) to Expert mode cards that have a dozen or more moves that must be performed in exact order. We found it best to have a pad of scratch paper handy in order to write down the moves we had taken to easily compare with the solution once we think we have it solved. 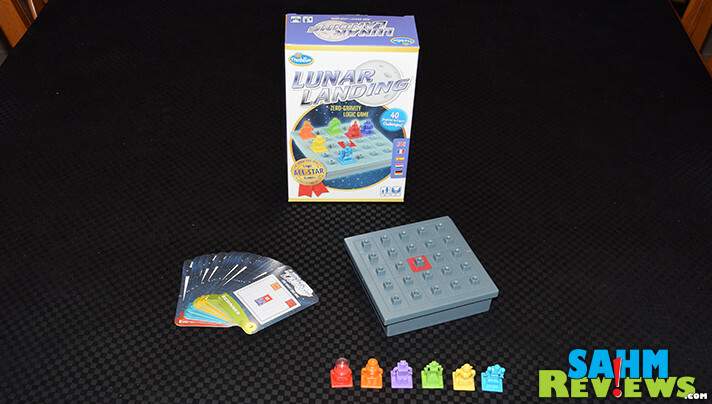 Lunar Landing is another solid logic game that should keep all ages occupied for quite some time. While some challenges appear unsolvable at first, they all have at least one solution. 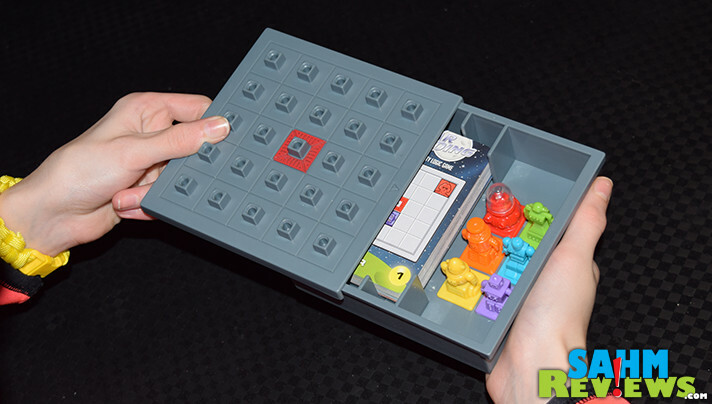 The travel-friendly container and pegs that hold the robots make Lunar Landing an excellent choice for a travel game. 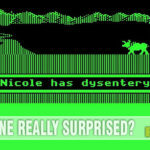 And at under $15 on Amazon, one that you won’t mind getting an extra copy so each sibling can have their own go at it! We just got word that ThinkFun’s 2018 lineup of games & puzzle are destined for the shelves very soon. You can find out all about them over on their website and by catching up on their Facebook and Twitter timelines. 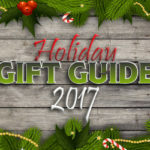 And while you’re waiting here on SahmReviews to hear all about them, enter to win a copy of Lunar Landing for yourself! Don’t forget to come back each day for more entry opportunities! Friend and family, and my dog. I would like Brad Pitt to join me on a lunar expedition. I would like my husband to travel with me. That way I can honestly say that I loved him to the moon and back! Plus it’ll be the honeymoon we never had! Someone a lot smarter than me. I would take all of my friends and family with me. Hands down my husband. We are going to see a meteor shower on a boat in Sept. in Maine. My best friend and my mom! The decision on who to have with me on a lunar expedition would depend mainly on how routine such a trip would be. If it had become routine, I would want family members. If it was still an exploratory thing, I would definitely want someone thoroughly trained in space survival!